Welcome to my third Online Blog Reader challenge. This month we shopped at FusionBeads.com. I picked out the initial components to work from, you can see the shopping list here. Everyone that participated used the components that they could get their hands on, and the rules were loose in that participants could use a focal of their choosing, and any additional beads could also be added. The skies the limit, in that participants can create a necklace, a bracelet, earrings, whatever their heart desires. This is my finished necklace. As asymmetrical necklace where the owl toggle from Green Girl Studios is the main focal. Up the left side of the necklace I used the olive leather cording, and beaded 2 strands with the faceted glass rounds, and some Vintaj Brass filigree tube beads. Then at the back and down the right side, a double strand- beaded with the wood rounds, and seed beads, and pairs of lucite leaves at 4 intervals. It's not a really exciting design but it is definitely wearable, earthy and Nature inspired! "These are not colours I would normally use but I did find others in my stash to match. I couldn't use the clasp I bought. The owl was sold out so I bought the butterflies instead. I think the owl would have worked well with the forest like them but the butterflies seemed too delicate. So, I used a brass elephant clasp for a different feel that made me think of India. I bought the leather lace too and didn’t find a place for it. Sometimes I feel you need to be able to edit yourself or you end up with bead “vomit” by trying too hard to used everything." Here is another emailed submission! Betty Stafford put togther a beautiful necklace. 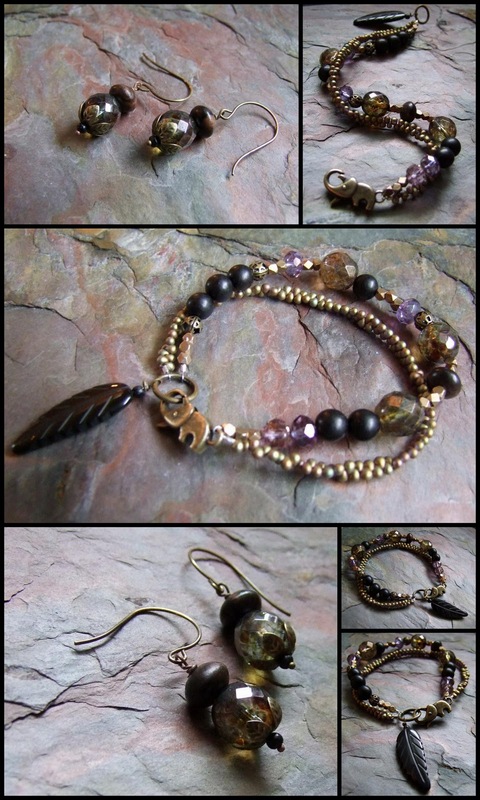 "Loved the beads Lorelei chose, especially the colors. I was constantly reminded of the wintry landscape out my windows as I worked on this piece. I did find the drop seed beads a bit of a challenge to incorporate, but think they worked with the leather at the back of the neck. I was unable to get the Lucite leaves, but added a small hill tribe silver leaf to the clasp with a bit of leather. The fire polished beads, wooden beads and leather with the Green Girl owl clasp really worked together in my opinion to create a winter woodland theme." Thank you Betty and Cilla for participating! LOL! "Bead vomit" made me laugh! Beautiful as always - the leaves remind me of butterflies : ) Happy Blog Hopping!!! I love your necklace! I really like how you used the owl as your focal. This has been such a fun challenge. I love all the beads, cord, clasp you chose. You necklace is so lovely. I love how you used the cord. I like the way it weaves in and out. Thanks so much for organizing this. I love doing it. I was able to get the links to be live this time. Beautiful blend of colors. The owl toggle is a fav!! I love Cilla's bracelet and earrings - that little elephant is too dang cute! Perfect. This is Really elegant Lorelei! really so Lovely! Loved how you used the leather, beautiful necklace. And Cilla's piece is beautiful too! LOVE your designs and most of all the leather...I could NOT figure out how to use it! Your use of it is wonderful! And Cilla's piece is great! Loved the "bead vomit" statement! That elephant clasp is really neat! Thanks again for hosting! Can't wait for another! Love your piece. I think it ROCKS! And I adore what Cilla did! I love it. It's such a cute design! I love your piece - especially how you used the leather cording. It adds so much movement to the necklace and draws attention to the beautiful fire-polished beads. 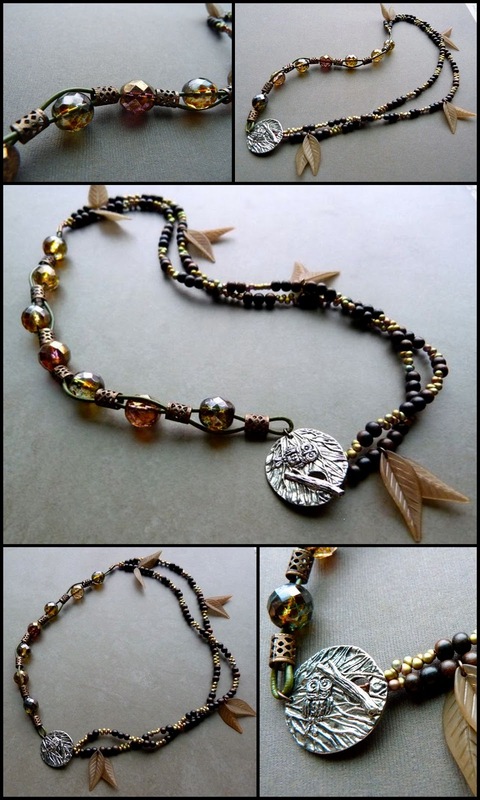 Cilla's pieces are beautiful as well, and I love what she had to say about editing to avoid bead vomit - hysterical! Thanks again for hosting this fun hop - I can't wait for the next one! Beautiful pieces as always! You really picked a great bunch of beads for this challenge. I've been hopping the blogs this morning and I have to say that everyone stepped up to this challenge big time. Lorelei, firstly, thank you so much for doing another challenge! They're such fun, and lead to meeting so many cool people. Gorgeous Lorelei! I love the woven leather cord with the brass spacers. Very cool! Cilla's bracelet is gorgeous too! Thanks for hosting another great challenge! It's a beautiful piece, Miss L. Can't wait to see what all the other participants do! Very classy necklace Lorelei. There is just something about it that says classy I think. It is beautiful! And Cillas bracelet is very nice, I particularly like the lilac addition. Nice touch. I am chuckling at the bead vomit comment too! All of these are so beautiful. I love what you did with the leather cord, Lorelei. Always inspiring. And thanks for hosting these fun challenges! I couldn't play this time, but hope to hop with you again. Off to enjoy the hop! Lorelei, your necklace is gorgeous. Thank you so much for organizing this. I enjoyed participating and seeing everyone's work. All of these are great designs. I love the bead vomit comment. Hilarious. Sometimes I feel like I have that problem when trying to string beads instead of a simple wire design. I have to agree I love what you did with the leather cord, very nice! The whole necklace is lovely! Cilla I really like the addition of lilac in your bracelet. Betty nice necklace, I like the way you used the seed beads. I'm off to blog hop! Thank you again for a fun challenge Lorelei! Lorelei, I love your necklace and how you used the green leather cord. So cool! Thanks for organizing this blog hop. I love the way that all the components come together in your necklace, your design is so fresh. Love Cilla's and Betty's pieces too, they are both beautiful. Thank you for organizing this fun challenge. I am home from work, dinner is done and I am off blog hopping. These are all gorgeous - but with such lovely ingredients, we couldn't really go wrong, could we?! Thanks for this fun challenge! Your necklace is beautiful. I love how the leather chord weaves in and out of the tube beads. I couldn't wait to get home from work and look at everyone's pretties. Thanks again, it;s been SO much fun!!! I really loved the components you chose this time and I want to thank you for organizing this. These blogs hops are always so fun! I'm always impressed by how well you do asymetrical pieces-its not east to get the right portions of balance and unbalance! I love your bracelet and earrings and you made me smile! You created a very lovely necklace. I was SO looking forward to this reveal -- what an awesomely talented group! I hope to participate in the next one (if you have one); this was so inspiring! Great work, everyone! Love the beautiful necklaces and bracelet you all created! Can't wait for the next challenge!!! I like both those designs that you have shown here. What a fun challenge - I really would have love to participate, but by the time I tried to order, most of it was sold out...... shoot. Maybe next time. But thanks for chosing an online store, so we internationals can join in. i'm a little late getting around to commenting ..but i wanted first to thank you for hosting this challenge..it's always so fun to see what everyone creates with basically the same items..
your piece was beautiful,you always have such a lovely rhythm to your work. Thank you to everyone on your kind comments. I was so impressed with the quality of this challenge. Magazine publishing quality if you ask me! Thanks so much to Lorelei! and I too am looking forward to the next one! This was an awesome challenge, I loved looking at all the entries, and I hope there will be another challenge like this!